Silent Hill is a 2006 adventure horror film directed by Christophe Gans and written by Roger Avary, based off of characters and treatment written by Nicolas Boukhrief and Christophe Gans. The story is an adaptation of the first Silent Hill video game created by Konami. The film includes elements from Silent Hill, Silent Hill 2, and Silent Hill 3, with music from 1, 2, 3 and Silent Hill 4: The Room. It was released in theaters on April 21, 2006 by TriStar pictures. The film follows a loving mother who takes her adopted daughter to Silent Hill, the only clue to her daughter’s sleepwalking condition. After being knocked unconscious in a car crash, she awakens to find her daughter missing and the town engulfed in fog and falling ash. She proceeds to search the town for her daughter and discovers her daughter’s connections to the town of Silent Hill. The film opens with Rose Da Silva and her husband Chris chasing their adopted daughter Sharon, who has been experiencing severe nightmares and sleepwalking, after she wanders from their house and almost walks off the edge of a cliff. Their only clue to the girl’s condition is her repetition of the name “Silent Hill”. Desperate for answers, Rose decides to take Sharon to the town of Silent Hill, despite Christopher’s opposition to the plan. On the drive to Silent Hill, Rose stops at a gas station to ask for directions. Cybil Bennett, a police officer from Brahams, asks if Rose needs help, but Rose declines and heads on her way. Showing a hint of suspicion, Cybil takes note of Rose’s license plate. Rose proceeds on her drive to Silent Hill and Cybil attempts to pull her over. After noticing the turnoff to Silent Hill, Rose drives off quickly to escape her. Suddenly, the figure of a young girl wanders out in front of the car and Rose is knocked unconscious in the following crash. Rose awakens to find that Sharon is missing and that she is on the outskirts of the town of Silent Hill. Rose searches the empty, fog-enshrouded streets of the town for her missing child. After following what she thinks is her daughter’s figure into a dark alley, Rose experiences a surreal shift into a darker version of the town. She stumbles across a mutilated figure clothed in mining gear hung to a wire fence, complete with bloody floors and fences made of metal grating. Suddenly, Rose is attacked by a Grey Child. Dozens more show up, causing her to flee into a nearby building. Rose stumbles and is about to be overwhelmed by the creatures when the Grey Children and the surface of the room around her begin to disintegrate, and she loses consciousness. Upon awakening, she finds herself back in the Fog World inside of a dilapidated bowling alley. Venturing out once more, Rose finds one of the main roads leading out of Silent Hill gone, collapsed into an abyss of fog. A mysterious woman, Dahlia Gillespie, arrives and speaks of the terrible things done to her own daughter, Alessa, by the townspeople. Dahlia claims that Sharon is actually her own daughter and not Rose’s. After Dahlia almost pushes Rose off the edge of the collapsed road in an almost insane rage, Rose runs back to her car and finds a drawing in Sharon’s notepad of a school. Suddenly, Cybil turns up and places Rose under arrest for attempting to flee from her previously. As Rose is placed in handcuffs, Cybil reveals she too crashed and woke up in Silent Hill. They start to walk and attempt to head back to the Brahams police station but discover that the road out of the town has mysteriously disappeared. Backtracking the way they came to find a radio tower, Cybil sees something wandering towards them through the fog. As it gets closer, they realize it is another one of the town’s creatures and it starts to shoot boiling acid at Cybil. While Cybil shoots at the monster, Rose takes the opportunity to run back into the town. After slipping the handcuffs to the front of her so her hands have limited use, she uses bus signs to find Midwich Elementary School, where she believes Sharon is hiding. Inside the school, Rose sees the figure of a child who looks like Sharon run into the girl’s bathroom. She enters the bathroom and opens one of the bathroom stall doors to discover the body of a janitor wrapped in barbed wire with a piece of a hotel keychain in its mouth. Rose takes the keychain and is about to leave when strange suited figures arrive. They spot her and Rose uses the keys she finds in the main office to keep them out of the bathroom. Suddenly, the figures leave quickly as a warning siren blares. Rose switches on her flashlight and sees the bathroom physically begin to rot and degrade as it shifts into the Otherworld. The body of the janitor is now alive and crawls along the floor still wrapped in barbed wire. Rose manages to escape before he catches her. Meanwhile, Christopher has studied reports and online articles on Silent Hill, and the dangers it possesses. Worried for his wife’s safety, he takes it upon himself to drive out and rescue her. He is reluctantly aided by Officer Thomas Gucci. Under the guise of keeping Christopher safe from the harms of the underground coal fire and other natural dangers of the town, Gucci guides the worried father around. The officer reveals his father once owned the local barber shop, and talks about how everyone left due to the coal fire. He sympathizes with Christopher, but is more immediately concerned with the man’s safety and is keen to leave. Eventually they reach the school, where Rose currently is still trapped in the Otherworld. Although the two of them cannot see each other, at one point they walk through the same area at the same time, and Christopher believes he feels Rose’s presence, even smelling her perfume. However, Gucci doesn’t believe him. He and Gucci ultimately leave the town without much hope of finding her. Rose runs through the dark and rusted hallways and collapses in tears, believing she can’t go on. As she is about to be overrun with Creepers, Cybil suddenly shows up and saves her, having apparently been dragged into the Otherworld along with Rose. Trapped inside the store room, the two of them are attacked by Pyramid Head. Just as the monster is about to break into the room, he breaks off his attack and the world shifts back into the Fog World. Meanwhile, Christopher has ignored Gucci’s pleas for him to go home, and has broken into the Toluca County Archives in a desperate search for any information that could help him in his search. He discovers documents showing the town was abandoned after a terrible fire 30 years prior, along with a photo of Dahlia’s daughter, who bears a remarkable resemblance to Sharon. Christopher is apprehended by Officer Gucci when he tries to question Sharon’s orphanage, and is told to stop investigating Silent Hill or risk being arrested. In exasperation, he finally relents and heads home. Back in Silent Hill, Rose and Cybil make it to the Grand Hotel, where they encounter a young woman named Anna. Searching the building, they visit Room 111 and discover a secret passage to a hidden sanctuary, where Rose encounters a little girl who resembles Sharon, albeit much darker: Dark Alessa. After Dark Alessa bursts into flames, another siren blares out and warns of another impending shift to the Otherworld. Anna implores Rose and Cybil to follow her to the church. On the way to there, the Otherworld begins to consume the church grounds. Anna doesn’t survive as Pyramid Head grabs her and rips her apart. Rose and Cybil find refuge in the church which is spared from being transformed by the Otherworld where they discover the remaining townspeople; a religious cult, headed by a woman named Christabella. Christabella tells them that a ‘demon’ controls the town’s shifts of reality and that Rose must face the ‘darkness of hell’ if she wants to find her daughter. After convincing Christabella that she wants to find the ‘demon’ for answers, Rose is taken to a hospital with Cybil to find it. Christabella discovers the likeness between Sharon and Alessa from Rose’s locket and condemns Rose and Cybil as witches. Cybil is captured as she defends Rose, who escapes the clutches of the cult and descends in an elevator into the basement of the Otherworld hospital. After a close encounter with the monstrous Dark Nurses, Rose finds a badly burned adult Alessa lying in a hospital bed, unable to walk or speak. Meanwhile, a nurse in red hospital robes is crying and covering her face. Dark Alessa appears again and explains why Alessa is like this. Rose learns that Dark Alessa is the manifestation of the dark side of Alessa’s soul. In an extended flashback, Rose discovers that Silent Hill had a history of ritual witch burnings. Alessa herself was condemned as a witch for strange happenings related to her and an attempt to burn her 30 years ago went disastrously awry, resulting in a devastating fire destroying the town. In her hatred, Alessa began manifesting her psionic powers and ended up creating Dark Alessa and the Otherworld. Since then, she has been shifting reality to the hellish nightmare in order to hunt down the cult members who hurt her all those years ago. Rose is told that Sharon is the manifestation of Alessa’s remaining innocence and goodness, and was taken to the orphanage by Dark Alessa, where she was later adopted by Rose and Christopher. Dark Alessa warns Rose that Christabella will know where Sharon is hiding, and that she’s already making plans to burn her, just as she did to Alessa. After realizing what she needs to do, Rose agrees to help Alessa gain her final revenge to save her daughter. After explaining that the church’s protection from the Otherworld prevents her from getting inside, Dark Alessa then makes Rose absorb her so that she can enter the church. After this, the camera pans over to the nurse sitting in the back of the ward, still crying. She uncovers her face to reveal that she has been crying blood, a result of Alessa’s attack on her 30 years earlier. Rose enters the church soon after Cybil has been burned to death by the townspeople and sees Sharon is about to suffer a similar fate. She confronts the townspeople and Christabella with her new knowledge of the truth, attempting to convince the cult that they are in denial of their own fate. Christabella stabs Rose in anger, claiming that Rose has been corrupted and is an agent of the ‘demon’. Rose’s wounds cause her blood to drip onto the church floor, releasing Alessa’s tainted essence and opening a portal into the Otherworld. Dark Alessa and Alessa’s adult form rise out of a pit, and proceed to kill Christabella and the townspeople with long tangles of barbed wire, leaving Dahlia, Rose, and Sharon as the only survivors. Sharon and Dark Alessa lock eyes, causing Sharon to faint. Rose and Alessa leave Silent Hill and return home. At the same time, Cristopher returns home from his search of the archives. Although Rose and Alessa are in the same room as Christopher, the same situation as the one at the school is present. Neither one can see the other, but Christopher still appears to feel Rose’s presence and the door has mysteriously opened by itself. As Sharon leaves the room, her expression turns dark, indicating that Alessa’s two halves have finally rejoined after 30 years. In the original script, there were only female characters, but the studio demanded more men be added. Sean Bean’s and Kim Coates’ characters were added and the script was approved. At the start of the film, when Rose pauses under the overpass while looking for Sharon, several recognizable items are spray-painted on the wall in the background, including “The GMC logo” and “The Beatles”. During a wide shot, spray-painted in the uppermost right corner are the words “Cheryl and Wolf” (a reference to Claudia Wolf); the shot then cuts to a close-up of “Cheryl”. The film features various references to Silent Hill 3: There’s the “Cheryl and Wolf” spray-painting near the beginning, referencing the game’s protagonist and antagonist, Cheryl/Heather Mason and Claudia Wolf. Sharon’s line “Don’t talk to strangers” quotes Heather Mason’s first encounter with Douglas Cartland. Also, a symbol very similar to the game’s Virun VII Crest can be seen twice in the Otherworld version of Midwich Elementary School when Dark Alessa appears at her desk scribbling furiously. Throughout the movie, “Brahms” is spelled “Brahams”. Ironically, Cybil Bennett is the only one to actually say the word “Brahams” in the whole movie while her last name is misspelled in the promotional newspaper for the movie. Most of the monsters featured are taken from Silent Hill 2: the Lying Figure (‘Armless Man’), the Bubble Head Nurse (‘Dark Nurse) and Pyramid Head. The Mannequin creature is also somewhat referenced, as there are two scenes that prominently feature broken-down mannequins. Otherwise, the only monsters adapted from the first game are the Mumbler/Grey Child and the Creepers. The only original creature featured in the film is ‘Colin the Janitor’. There were over 100 different outfits made for Radha Mitchell, changing subtly from a dark chocolate shade to blood red. 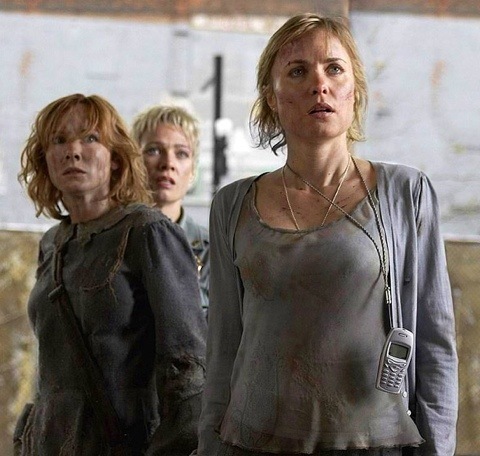 Radha Mitchell didn’t wash her hair through most of the filming to help the dirty unwashed look of her character. The character of Dark Alessa is never credited in the movie’s cast list, however, she is named as one of Jodelle’s characters on the official site, in interviews, and in the film’s presskit. Screenwriter Roger Avery based the movie’s Silent Hill on the town of Centralia, Pennsylvania, which also has a coal fire that still burns today. 160 sets were used in the movie. The gas station Rose Da Silva stopped at and passes at the end has gas listed as per liters instead of the American gallons. When Christopher Da Silva asks about Sharon at the garage, the mechanic is working on a Dodge Magnum with a West Virginia license plate on the front of the car. West Virginia doesn’t require, nor is it possible to have, a state license plate on the front of the car. The image of West Virginia on Cybil Bennett’s arm patches is backwards. When Alessa Gillespie rises into the church to take revenge on the people responsible for her current state (after Rose is stabbed), you can notice that the burnt make up done on her is actually bandage and the bandage has not covered her elbow. Her actual elbow is showing when all of her body parts are supposed to be scarred. As the miners are trying to break down the washroom door, the camera pans over the door frame from Rose’s side to the miners’ side. Just as it settles into its final position, you can see the sliding wall section they used to allow the camera to pan, sliding back into position on the left of the door frame. When Christopher breaks into the Brahams Archives offices at about 0:59:45, the clearly visible orange anodized end caps and typical wiring on the fluorescent tubes identify them as Kino-Flo lights, a specialist type manufactured solely for the film industry. The arrangement is quite different to a conventional domestic lighting system. Orange end-caps indicate a tungsten-balanced tube; blue would be daylight. When Alessa’s barbed wire is killing everyone, the ladder that Sharon is supposed to be tied to is clearly visible and Sharon is not there. I thought both Silent Hill movies were great. Pyramid Head A.K.A Red Pyramid is in it. Campanella was a great actor for Red Pyramid. I thought that the films were great. They were much like the games which use subtlety and extremely deformed monsters to scare to the viewer. I wish that the films were more specific on the history of the town and how The Order was formed. If the films did that, I think the story would’ve been more understandable. My favorite monsters in the films were Pyramid Head and the thing that shoots some type of acid from its chest.